Need to blow off steam but on a tight budget? 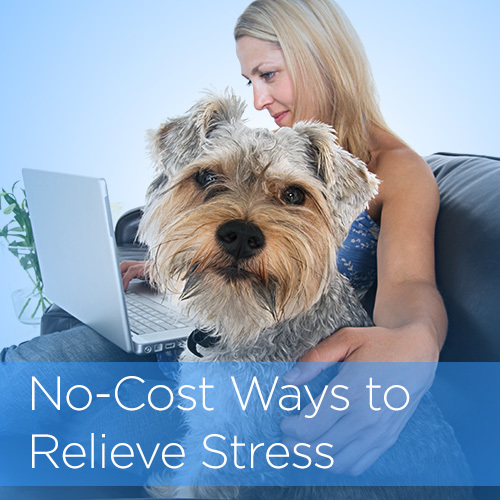 Try these free steps to a more stress-free life. 1. Take your dog for a walk. Walking is an excellent way to unload unwanted stress—and if you have a dog, he or she will thank you for the exercise. 2. Declutter your home. This is sure to take your mind off whatever is bothering you—and the result also leaves you feeling less stressed. 3. Talk to someone. A trusted friend can be a great ally — and simply taking the time to talk can help ease your burdens. 4. Take photos. Photos are a great way to focus on what’s positive in your life. When things seem gloomy, you can still find something beautiful to focus on. 5. Pet your pet. Humans feel less stressed when they pet a dog, cat or other animal. Dogs are used to rehabilitate wounded soldiers and relieve stress in students. Don’t own one? Visit an animal rescue center for some furry stress relief. This entry was posted on Tuesday, September 9th, 2014 at 4:38 pm	and is filed under Primerica. You can follow any responses to this entry through the RSS 2.0 feed. You can leave a response, or trackback from your own site.